Will patent wars come to Windows Phone? Nokia may be ready to set its legal dogs on HTC over the design of the new company's newly announced Windows Phone 8X smartphone. According to a Phone Arena source, the feeling emanating from Espoo, Finland is that the Taiwanese manufacturer has copied the look and feel of the recently-announced Nokia Lumia 820 handset. Nokia "feels strongly" that the front panel and the curved sides of the Lumia 820 have been unfairly emulated by the HTC offering - unveiled just two weeks after Nokia's Sept. 5 reveal - according to the tipster. The report suggests that Nokia will seek a sales ban on the HTC 8X in some territories. The Lumia 820, the smaller sibling of the flagship Lumia 920, offers a 4.3-inch Clear Black LCD screen and a polycarbonate body, which comes in an array of bright colours. 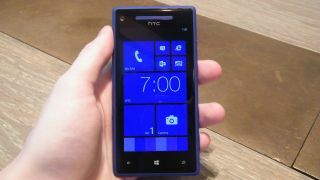 The HTC 8X is the HTC's top-of-the-line Windows Phone 8 offering and also features a 4.3-inch screen, a top-notch spec list and an equally bright array of colours. Chris Weber, Nokia's head of marketing, also publicly called out HTC's new phones - which includes the lower-spectrum Windows Phone 8S - as "rebranded products," though he didn't say either design copied his company's products at the time. It's the physical similarities listed above as well as HTC's status as the main threat to Nokia's Windows Phone-led comeback, that is likely to have irked Nokia, if the reports are to be believed.